Port Ghalib resort is set at the edge of the natural coral reef aquarium of the Red Sea. The complex of 5-star hotels and a marina is nestled between the Red Sea and the Sahara desert. Port Ghalib is only 10-minute drive to Marsa Alam international airport. 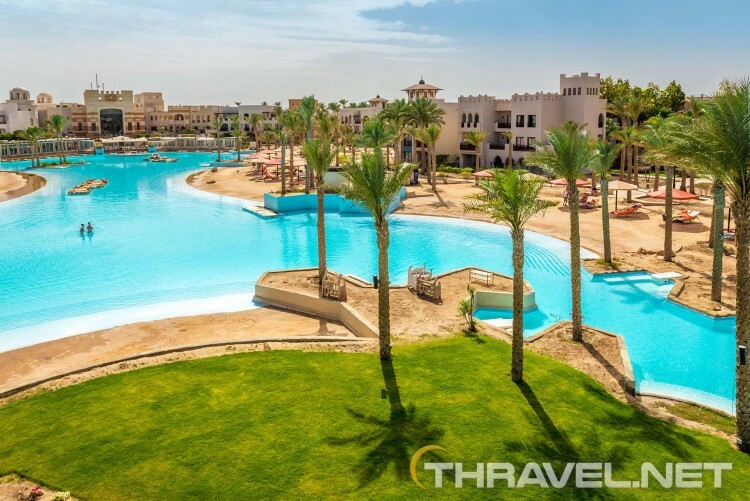 The luxury Red Sea resort lies between Marsa Alam and El Quseir. The area is one of the most attractive scuba diving and snorkeling destinations in the world. A couple of years ago, the place was an inhabited desert. Since then it has been transformed into a 5-star resort and marina complex. The project covers 18km of the Red Sea coastline. Now Port Ghalib resort looks like a fortress. Inside its gates, there are elegantly designed buildings, green gardens and a huge salty lagoon. Is it safe to travel to Port Ghalib, Egypt? In February 2018, we chose Port Ghalib as a winter destination because of its reputation of a safe and secluded place in Egypt. Frankly, this was a great time to travel to Egypt. The political situation while making life difficult for hotel managers is a boon for tourists. Vacation packages were at their lowest prices. We enjoyed most of the things we were looking for — incredible sea life, warm sea water and mouthwatering local cuisine. The ratio price-quality was far surpassing our expectations. In 2018, Port Ghalib was, in fact, the safest Egyptian resort for tourists. Since we were not sure if It was safe to leave the resort, we did not arranged tours outside the hotel’s premises. The idea of a tour to Luxor was tempting but when coming across the fact that the driving time was 10 hours (two ways) we rapidly changed our mind. Port Ghalib is located on the Red Sea coast featuring an amazing house reef. Dozens of coral fish species come so close to the shore that you can admire their beauty even without get wet. The house reef is the best we have ever seen. We did not have to travel far to see such a variety of underwater species. It was just few metres from the shore! We have never been to a place that actually boasts such dramatic diversity and impressive collection of coral species. The impression was as if we were standing in front of an aquarium probably because The Red Sea waters were azure and transparent. From Port Ghalib beach to the sea, there are two bridges that lead to the spectacular walls of the house reef and the snorkeling spots. There swimmers are able to see beautiful coral gardens with live corals. The impression is like reef grows directly from the shoreline. The reef population includes Blue Spotted Stingray, Moray eels, Lionfish, Clownfish, Masked butterfly fish, Emperor Angelfish, Green turtles and many more. When the underwater current is strong,the most convenient spot for snorkeling and diving is at the edge of the bridge located near Porto Ghalib Palace. The Palace Port Ghalib is the most luxurious of all hotels in the area. We like the sophisticated architectural style that blends perfectly with the landscape. Both the interior and the exterior are tastefully decorated. The Palace covers relatively small territory compared to other Red Sea hotels but features the most stylish outdoor pool and garden areas. We found the layout of the hotel very attractive with beautiful inner gardens. It was pleasant to walk from our hotel – Port Ghalib resort and The Palace. At night, the path along the beach was lighten up, there were lights in the garden, on the bridges over the salty lagoon as well as in the palms. Siva Port Ghalib Resort shares the facilities such as reception, lobby bar and a restaurant with Port Ghalib resort. The outdoor area looks unfinished with no vegetation. The hotel’s premises are surrounded by a salt water lagoon. Port Ghalib Resort is the biggest and funniest of all Port Ghalib hotels. In fact, we know it best because we stayed thеre during our vacation. We like the elegant foyer which was designed in very good taste. People from the animation stuff told us that the furniture was purchased from famous Italian and Spanish manufacturers. Rooms are styled in Arabic design with rustic mosaics. Our room was on the ground floor with a private space in a lush garden. Inside, there were king size bed, a sofa, Tv with international channels, mini fridge, safety deposit box and all the amenities we needed. The Port Ghalib resort features a large pool which is heated in winter. The main attraction is the salt-water lagoon. Another swimming pool with two water sildes is a few steps from the hotel. The main entertaining area is within hotel’s premises. The golden sandy beach of Port Ghalib is very beautiful. The furniture is luxurious offering privacy, intimacy and enough space for tourists. We enjoyed comfortable sunbeds and the fact that each pair was surrounded by decorative fence. Port Ghalib guests wear all-inclusive bracelets. There are different colours of bracelets depending on the hotel selected. In general, all-inclusive hours are shorter compared to similar resorts in the Caribbean, for example. The beverages are available only by glass served by hotel’s staff. You are not allowed to pour by yourself a glass of wine or beer. All-inclusive alcoholic beverages are available until midnight even in the New Year’s Eve. At the counter service at bars and restaurants, only local spirits are free. Coffee station refiling in the rooms, fresh juices on the breakfast and bottled specialties are paid. The all-inclusive package includes a 1.5-littre bottle of water per room per day for free. The main restaurant at Port Ghalib resort offers a variety of local, regional and international cuisine for breakfast, lunch and dinner. There is a dietary corner at the main restaurant Souk Al Hana. The restaurant also features cooking stations where the cooks prepare local and international specialties on the spot: omelettes, desserts, pitta bread with meat and vegetables, pancakes and pasta. Souk Al Hana can be visited by the guests of Port Ghalib Palace, Siva Port Ghalib and Port Ghalib resort. During the hours between breakfast and lunch, pastries are available at the pool bar. Between 15:00 to 18:30, you can get only French fries, burgers and ice cream. In a small hall above the main restaurant is located the Lebanese a-la-cart restaurant. Probably it is sharing the same kitchen premises and cooks as the main restaurant. Port Ghalib guests are allowed to book a diner once per week at Lagoon restaurant. It is also a buffet style restaurant offering almost the same food as the main restaurant. Cardamom restaurant is close to the beach. Eating there is a subject of additional charges. Lobby bar is a great place to relax or have fun. There is a special Shisha corner which is an open air space. Beach towels are provided free of charge along with a comfortable bag. Bags are located in the rooms and housekeepers change them every afternoon. In case of a lost towel and a bag, they charge a fee of 10 euros. A large variety of activities is included in the all-inclusive formula. Guests are allowed to book every day tennis, mini golf or table tennis. Daily entertainment program includes beach volleyball, water gym, yoga, belly dances, Latino lessons and night show. Most of the thematic show programs are interactive. The scenario includes participation of the tourists. Free WI fi is available at the lobby and the main restaurant in Port Ghalib resort. We were able to use free the net Siva Free as well as Siva charge. Once per week the resort organizes beach party. There is a fee of 10 euros per person to join the event. The price includes unlimited drinks. The party starts with a dance show followed by Dj session and open dance floor. There is another party organized by Red club. The place is located on the harbor. The party takes place once per week and the entrance fee is 10 euros. It is easy to walk to the venue. In general, the Marina complex attracts many tourists at the evenings thanks to the abundance of cafes, restaurants, and souvenir shops. It is really great that Port Ghalib resort has something for everyone. Still, we preferred the daily activities, swimming in turquoise waters and admiring desert landscapes around this Red sea resort.